Kell 'Special K' Brook (28-0 18KO) will take on Hector David 'El Tigre' Saldivia (41-2 32KO), on the 20th of October, the fight will probably take place at the Motorpoint arena, in Sheffield. This fight is billed as a final eliminator for Randall Bailey's IBF Welterweight title, Bailey is fighting Devon Alexander in September, the winner of that fight will probably fight the winner of Brook/Saldivia sometime next year. This is a cliché that I have used a lot lately to describe some up-coming fights, but I believe that someone definitely get's stopped in this fight. Saldivia has been stopped twice in his career, once in the 5th round, and the other in the first round, after dropping his opponent. 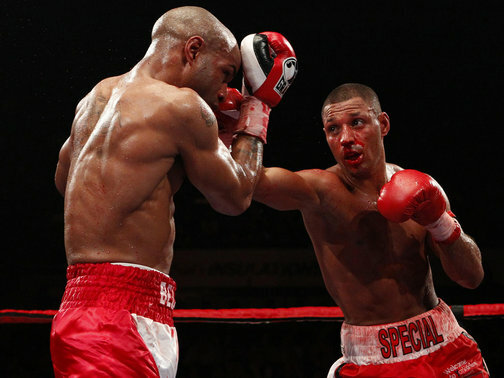 Brook hasn't been stopped or knocked-down, but he was in trouble several times in the late rounds of his last fight with Carson Jones. I think Brook's best chance to win is in the first half of the fight, and Saldivia's best chance to win is in the later rounds of the fight. My pick for this fight is Brook by TKO, I think he has more skills than Saldivia, and Saldivia is vulnerable to being stopped in the early rounds. I know Saldivia was stopped in one round in that video, but in that fight he proved he is exciting, and has a big punch, so his fight with Brook later on in the year will have some fireworks. What do you think of this fight? Does Saldivia have a chance of winning?